Mister Fantastic is the leader of the Marvel superhero team the Fantastic Four. He is known for being one of the most brilliant human minds in the Marvel universe. 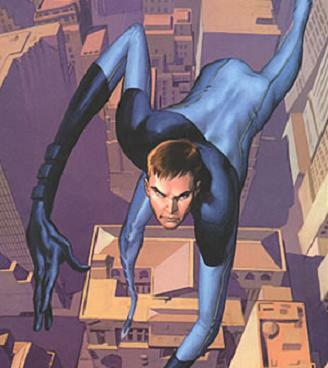 Mister Fantastic has appeared in multiple movies and video games. Reed Richards is a child prodigy with an amazing aptitude for mathematics, mechanical engineerings and physics. By the age of 14 Reed Richards was attending college and by the time he was 20 he carried a multitude of scientific degrees under his belt. Reed meets a pilot in training by the name of Ben Grimm. Ben and Reed become lifelong friends. Ben sees Reed designing a space ship and remarks that he would like to pilot the craft one day. When Reed is 19 he also runs into a 13 year old girl named Sue Storm who becomes enamored with the genuis. Reed is generally embarrassed by the infatuation of the young girl and eventually moves away. Reed meets the fellow prodigy Victor Von Doom while attending Columbia University. Victor had never met another person whose intelligence could rival his own. He began working on various dangerous experiments to prove that his intelligence was superior to Reeds. One of these experiments ends with scarring Victor's face. The vain and prideful Victor was greatly hurt by this and forever carried a grudge against Reed. Reed Richards begins a research project to travel to Mars. Along the way he is reunited with the now adult Sue Storm whom he marries. Ben Grimm also joins him to fly the spacecraft just like he said he would in college. The government begins to threaten to cut funding to the project and ground it. Reed, Sue, Grimm and Sue's brother Johny decide to sneak in and launch the space ship anyways. During the trip the 4 members are exposed to a special type of cosmic rays in the Van Allen Belt. The ship lacked enough shielding to block the rays in the Van Allen belt. Seeing that they could be killed if they proceeded to go farther Reed orders the ship to return to Earth. While all four members of the mission survive the radiation they find they are not the same. Each members develops powers that come out initially in a frightening way. Reed Richards develops a highly elastic body that he can use to alter his shape and stretch. While each member has problems with their new powers they also see that they can use them to do immense good. They create a team of super heroes and call themselves the Fantastic Four. The Fantastic Four went on to face a variety of threats and villains, while also juggling the strains of celebrity, their powers, and the drama of a family. Reed Richards has a highly elastic and malleable body that can stretch in various ways that are completly unnatural to a normal human. Using this ability he transform his body into various helpful shapes as the circumstances dictate. He can alter his mass and make himself bigger which can increase his physical strength. Reed Richards is an extremely accomplished theoretician, physicist and inventor. The money he makes from patents allows him to easily support the Fantastic Four. He is often considered to be one of the most intelligent human characters in the Marvel Universe along with characters like T'Challa the Black Panther, Tony Stark, and Hank Pym. He has said that other characters are more intelligent within certain subjects: Otto Octavius has a greater understanding of radiation, Peter Parker with biology, and Hank Pym with biochemistry. It has been implied at various times that Richard's elasticity can boost his intelligence by allowing him to physically expand the size of his brain. In the early 2000s Mister Fantastic was played in two films by Tim Story. Mister Fantastic will returned to the big screen and by played by Mile Teller, in the movie F4.